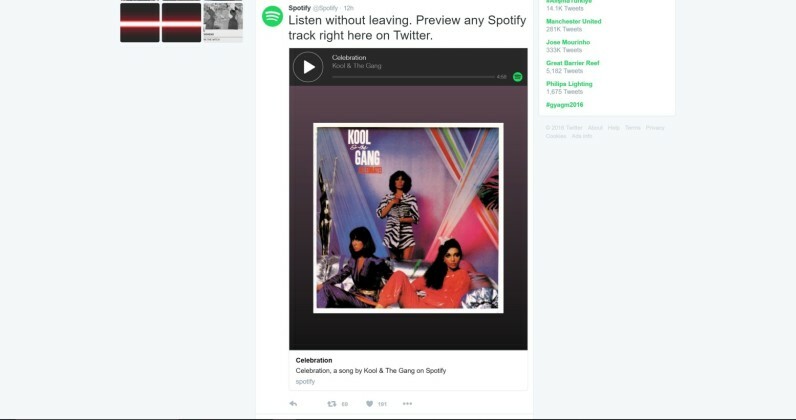 Twitter will now let you listen to Spotify music clips right from your timeline. The new audio cards let users listen to 30 second previews of song tracks in their feeds without having to open Spotify itself. Click or tap on the song to start playing the music, or click on the little Spotify icon to play the full song. To be clear, Twitter has had audio cards since 2014, when it got the ball rolling with SoundCloud and iTunes. The lack of Spotify support was the big elephant in the room. Today’s rollout means that you’ll probably start seeing a lot more people sharing soundbites on Twitter. Spotify partnered with Facebook to provide basically the same functionality in November. I’ve traditionally gravitated to simply using YouTube links to share music on social media, but Spotify integration makes it easier to share songs when you’re already in the middle of a playlist. Musicians are already a huge Twitter presence, including the top three most followed accounts. Now that Twitter will stop counting URLs in character counts, conversations about music on Twitter could get much more interesting.